The eyeball contains a fluid called aqueous humour which is constantly produced by the eye, with any excess drained through tubes. 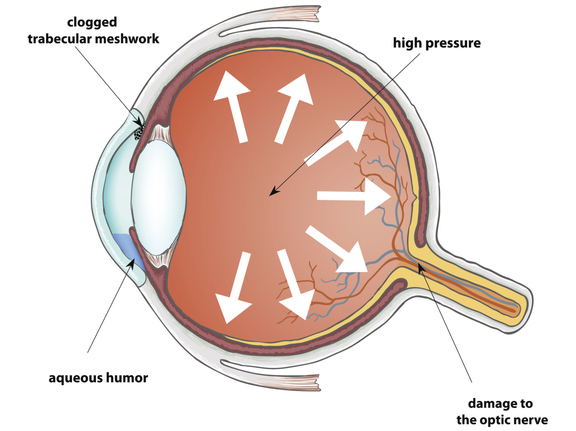 Glaucoma develops when the fluid cannot drain properly and pressure builds up, known as intraocular pressure. This is the most common type of glaucoma and develops very slowly. This is rare and can occur slowly (chronic) or may develop rapidly (acute) with a sudden, painful build-up of pressure in the eye. A rare but sometimes serious type of glaucoma which occurs in very young children, caused by an abnormality of the eye. There are several glaucoma tests that can be carried out by David. They are painless and quite quick. An eye pressure test and an examination of the optic disc as well as a field test are performed on those patients suspected of being at risk of glaucoma. As Glaucoma can be hereditary you are entitled to a free NHS eye test if you are over 40 years old and have a first-degree relative (mother, father, sister or brother) with glaucoma. You may also be entitled to a free NHS eye test if an ophthalmologist thinks you are at risk of developing glaucoma.